Season Two blasts open with shocking revelations about Jane Doe's true identity and her connections with the shadowy terror organization sandstorm. 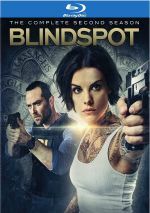 An action series that emphasizes its mysterious lead character, Blindspot moves ahead with its second season. This four-disc Blu-ray set contains all 22 of Season Two’s episodes. The plot synopses come straight from the series’ official website. Season One didn’t draw me in right off the bat, but I eventually came to like it, and S2 picks up pretty well where that one ended. “Rogue” digs into the overall narrative nicely and gets the season off to a lively start. Man, I’d almost forgotten how frantic Blindspot tends to be! I think that hyperactive style was the main reason I needed a while to embrace the series during S1, as its tone of semi-constant urgency threatens to derail the proceedings – “all climax all the time” can wear out the viewer. Until the viewer adapts to the style, that is, and eventually I swallowed the pacing. I need to readapt, as so far, S2 seems pretty over-caffeinated. Still, “Knot” gives us enough intrigue and action to work well. S1 spent a lot of time with explorations of Jane’s backstory, and S2 seems to want to mine that same territory, as it invalidates much of what we learned last year. That feels like a somewhat cheap/tacky choice, but it doesn’t bother me a ton because I expect a series like this to throw out plenty of groan-worthy plot twists. As long as S2 keeps the action fast and furious, I can overlook questionable story/character decisions. Sometimes I think the “Sandstorm” narrative exists just as an excuse to throw the team out on one daring mission after another. “Beth” manages to add a little intrigue, though, so maybe I’m wrong and the overall plot will coalesce better eventually. Though I don’t know how it’ll tie into the season’s overall arc, the plot of “Thefts” works much better than for the average Blindspot episode. It provides an intriguing thread with an enjoyable new character, factors that make it probably the best show so far in S2. Her Spy’s Harmed: “While Weller and Nas chase down an NSA whistleblower in Bulgaria, Zapata (Audrey Esparza) takes a major risk to prevent Reade from becoming a murder suspect, and Jane grows closer to Roman while assisting him on a Sandstorm mission. After the relatively tight focus of the prior episode, “Harmed” finds itself spread too thin. That makes it a more erratic program, though it comes with some strengths, mainly via PJ Byrne’s goofy performance as a hacker - Blindspot lacks much levity, so I’ll take the occasional light moment. Throw in Esparza in her underwear and the good outweighs the bad here. Rich acted as a highlight of S1, and ala PJ Byrne in the last episode, he adds needed looseness to this usually somber series. Add in a tight plot related to a super-assassin and this becomes a solid show. “Deaths” uses the standard Rashomon structure to spice up its storytelling. While not the most original motif, it gives the episode some spice and allows it to become a good one. After a few shows that largely focused on “standalone” stories, “Cooler” takes us back to the Sandstorm narrative. While I liked the respite from the season’s overall arc, I admit that “Cooler” brings us back with some interesting revelations – even if one of them comes as little surprise. Blindspot stretches credulity in many ways, including the fact virtually every part of its team eventually hooks up with another member. This seems like a cheesy choice, and it hampers “Nigel”. The rest seems okay, but the series’ push toward so much untenable romance feels too soap opera for me. Though it advances parts of the overall narrative, “Nigel” mainly acts as a standalone episode, and it does fine in that regard. I can’t claim it provides a particularly original terrorist tale, but it musters a decent level of tension. On the positive side: guest actor Amber Skye Noyes is really hot. On the negative side: the episode’s story feels like little more than an excuse to send the characters undercover into the biker gang. The negatives outweigh the positives in this lackluster episode. We get an episode fairly deep into “series mythology” here, and those parts tend to work reasonably well. The terrorism plot sputters, though, and leaves this as a mediocre show. As usual, Rich offers a lighter than usual tone for Blindspot. As long as the series doesn’t overuse him, he remains enjoyable and adds a fun touch to “Rob”. “Coward” gains some intrigue via the undercover pairing of Roman and Weller, and that side of things works pretty well. Other elements feel more ordinary and less compelling, especially when we follow Reade’s tedious/predictable descent. Of all the story arc-heavy episodes in S2, “Dwell” becomes the heaviest to date. That makes it a bit on the sluggish side, as we get a lot of explanatory scenes and not a ton of action. Add to that more soap opera related to various characters and “Dwell” sputters. Solos: “Jane and Oliver (Jonathan Patrick Moore) are kidnapped and held for ransom in retaliation for his father's financial crimes. Weller and team scramble to uncover their location before it's too late. C’mon – even when a team member gets a significant other, that person has a secret past, too? Can’t any of these people hook up with someone ordinary? That thread stretches credulity even in the nutso world of Blindspot and turns “Solos” into an eye-rolling episode. Because Blindspot comes with so many monotone characters, it’s always good to get a different kind of personality. Weitz isn’t a jokester like Rich Dotcom, but he still infuses energy into the somber series that it needs. Weitz helps balance out the soap opera parts of “Lines”. “Rager” allows the series to have a little more fun than usual, mainly due to the riddles Weller and Jane must solve. The episode pushes along overall plot elements nicely as well and becomes a solid show. Sending Zapata to jail as part of an operation seems like a stale choice – or maybe I’m just mad “Drown” includes no catfight in the shower. Whatever the case, this ends up as a more melodramatic show than I’d like. With only one more episode left after this, “Mom” acts mainly to set up the season finale. That makes it heavy on action but light on resolution. I expect that, and “Mom” preps us for the last show pretty well. Season Two concludes with a literal bang during the action-packed “Repel”. It brings the year’s narrative to a close well and makes this a satisfying finish – even if it ends with a teaser for Season Three, a collection of shows that apparently will take place two years after this one. Blindspot appears in an aspect ratio of approximately 1.78:1 on this Blu-Ray Disc. As expected, the shows looked good. Overall sharpness worked well, with only a handful of slightly soft wide shots on display. This meant the majority of the material provided concise, accurate imagery. No issues with shimmering or jaggies emerged, and the episodes also lacked edge haloes or source defects. Like most action/thriller work of this sort, Blindspot went for a heavily teal palette, with some orange/amber tossed in as well. The hues looked well-depicted within those choices. Blacks appeared dark and tight, while shadows seemed smooth and clear. I felt pleased with the visuals. 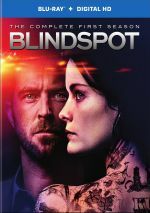 I also liked the DTS-HD MA 5.1 soundtrack of Blindspot. For the most part, the mixes hewed toward the front, where we got nice stereo music and consistently good sense of environment. With a lot of action on display, the rear speakers added a fair amount of information as well. Gunfire, vehicles, explosions and the like all fleshed out the spectrum in a reasonably satisfying manner. Audio quality seemed pleasing, with natural, concise dialogue. Music sounded bold and full, while effects appeared accurate and dynamic. The show came with more than satisfactory soundtracks. With that we head to the set’s extras, most of which come from a collection of featurettes. Breaking the Season goes for 11 minutes, 18 seconds and includes comments from creator/executive producer Martin Gero, writers/co-executive producers Brendan Gall and Christina M. Kim and writer/story editor Kristen Layden. “Breaking” looks at all the planning that goes into the storyline for Season Two. It becomes an involving and informative view at the backdrop for the year-long narrative arc. During the 11-minute, 16-second Premiere Revelations, we hear from Gero, Kim, Layden and Gall. They cover the new details that emerge in the season’s opener and other aspects of the episode. It follows “Breaking” well and adds useful insights. Next comes Family Secrets, an 11-minute, 46-second piece with details from Gero, Kim, Layden and Gall. Here they look at additional changes/developments for Season Two. “Secrets” doesn’t seem quite as good as the prior two featurettes, but it still adds some nice material. Conspiracies and Cover-Ups: Zero Division lasts six minutes 37 seconds and features Gero, Kim, production designer Andrew Jackness, and actors Rob Brown, Sullivan Stapleton, Audrey Esparza, Archie Panjabi, and Ashley Johnson. The piece examines some changes for S2, especially related to the addition of Panjabi and her character. It seems a little superficial but it gives us a few decent notes. A similar program, Conspiracies and Cover-Ups: Sandstorm takes up nine minutes, 51 seconds with notes from Gero, Stapleton, Panjabi, Layden, Gall, Johnson, and actors Michelle Hurd, Luke Mitchell, Ukweli Roach and Jaimie Alexander. As implied by the title, this show views material connected to “Sandstorm”. It becomes another decent but unexceptional overview. We move ahead with My Crazy Comic-Con Experience. In this three-minute, 23-second reel, Johnson and Gero discuss the Comic-Con experience. This turns into a fluffy piece, though a few funny moments emerge. From the same event, we get a 2016 Comic-Con Panel. It lasts 34 minutes, 33 seconds and features Gero, Johnson, Esparza, Brown, Alexander and Stapleton. They give us a preview of S2 and other thoughts about aspects of the series and season. These panels tend to be jokey and promotional, so don’t expect a lot from this one. A Bound and Gag Reel takes up six minutes, 17 seconds. In it, we get the usual compilation of goofs and giggles. It’s nothing out of the ordinary, but given the series’ somber tone, it becomes fun to see a little levity. We find 32 Deleted Scenes spread across 15 episodes. These fill a total of 24 minutes, five seconds. For the most part, these tend to be brief and they offer additional character information. Roman benefits most from these, hut even so, I can’t claim we learn anything important from them. As occurred during its first year, Season Two of Blindspot can seem too frantic for its own good. Nonetheless, once you adapt to its ADHD cutting/photography, it delivers a mostly entertaining – if ludicrous – action series. The Blu-rays boast very good picture and audio as well as a decent complication of bonus materials. Fans of S1 will continue to enjoy Season Two of Blindspot.